You may think it odd that I’ve decided to include a feature on a club from Riddlesdown…but don’t be fooled by the name. 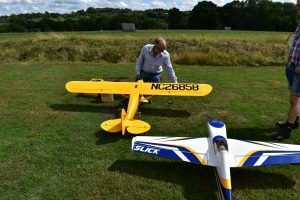 This Model Aeroplane Club actually meet up at a field in the Edenbridge area twice a week to enjoy their hobby of flying model aircraft. They are a small, well supported, sociable and very welcoming radio controlled flying club. They originally began in 1974 where they flew from a patch of land at the top of Riddlesdown, near Purley. From there they moved to a farm in Dormansland in the 80s and since last year have been flying from Edenbridge. Most members fly fix-wing models, whether powered by electric or glow engine, although they do have members who fly rotary, both helicopters and multi-rotor. For those who are new to the hobby, you’ll find several of the members who are capable of, and familiar with, teaching radio controlled flying using a tandem/buddy box system where two transmitters are joined together. This means that if you do get into trouble your instructor can take back control and save any damage to the plane. There is a club examiner so when you’re ready you can take the British Model Flying Association (BMFA) Achievement scheme’s Basic Proficiency or A Test. Stephen Fysh, committee member, invited me along to give radio controlled flying a go and I was very glad when he explained the buddy box system as I was a little nervous with the thought of what might happen if it went wrong, particularly after learning that it can take up to a year to learn to fly one of these planes. Stephen taught me a few basic manoeuvres in the air, made a little terrifying by the gusts of wind which kept taking control of the plane, but I managed a few turns with the assistance of Stephen on the tandem control. It was good fun and the members made me feel very welcome. Development in the radio controlled flying models has come a long way since the club started and now is a great time to get involved in this hobby. There is a wide variety of kits available at reasonable prices, many of which are part pre-built and require minimal time or experience to complete. They offer a quick and relatively cheap way to get in the air and the quality of the construction, technology and detailing has improved immeasurably over recent years. Some members also build more complex models, solely from plans, creating impressive scale planes, often with bespoke design and engineering features, and are more than happy to share this knowledge by providing hands-on help and advice to any aspiring builders – whatever their level. With small membership there is rarely any waiting time to get into the air and their site offers a generous runway, largely untroubled by trees or other intrusions. They also enjoy on-site BBQs and have use of a caravan should the weather turn and shelter is needed. The club also run a number of competitions throughout the summer months as well as fun challenges for members. You can view a video I took and uploaded to YouTube by clicking here.